Due to its simplicity and ease of use, PHP is a widely-used open source general-purpose scripting language. PHP is used for creating interactive and dynamic web pages quickly and can access a wide range of relational database management systems such as MySQL, PostgreSQL, and SQLite. Many of us already access MySQL databases by using either the MySQL or MySQLi extensions. As of version 5.1 PHP provides new database connection abstraction library, PHP Data Objects (PDO). PDO - PHP Data Object. A set of PHP extensions that provide a core PDO class and database specific drivers. Provides a vendor-neutral lightweight data-access abstraction layer. Focus on data access abstraction rather than database abstraction. PDO requires the new object oriented features in the core of PHP 5, therefore it will not run with earlier versions of PHP. - Core which provides the interface. - Drivers to access particular driver. -- PDO (Core) and the PDO_SQLITE driver (SQLITE driver) is enabled by default as of PHP 5.1.0. To access other databases you must enable the PDO driver. -- Next, choose the other database-specific DLL files and either use dl() to load them at runtime, or enable them in php.ini below php_pdo.dll. To get the effect of a new configuration in php.ini file you will need to restart PHP. The class represents a connection between PHP and a database server. Creates a PDO instance representing a connection to a database. dsn - The Data Source Name, or DSN, contains the information required to connect to the database. The string contains the prefix name (e.g. pgsql for PostgreSQL database), a colon, and the server keyword. username - A string that contains the user's name. This parameter is optional for some PDO drivers. password - A string that contains the user's password. This parameter is optional for some PDO drivers. driver_options - Optional. A key=>value array of driver-specific connection options. Returns a PDO object on success. If failure, returns a PDOException object. If there are any connection errors, a PDOException object will be thrown. You may catch the exception if you want to handle the error condition, or you can leave it to global exception handler which can be set up via set_exception_handler(). Here the user id is wrong. Here the database name is wrong. Error: SQLSTATE  could not connect to server: Connection refused (0x0000274D/10061) Is the server running on host "localhost" (::1) and accepting TCP/IP connections on port 5432? FATAL: password authentication failed for user "postgress"
// Following command close the connection. Many web applications will benefit from making persistent connections to database servers. Persistent connections are not closed at the end of the script but are cached and re-used when another script requests a connection using the same credentials. The persistent connection cache allows you to avoid the overhead of establishing a new connection every time a script needs to talk to a database, resulting in a faster web application. Turns off auto-commit mode and begins a transaction. The transaction begins with PDO::beginTransaction and will end when PDO::commit or PDO::rollback is called. The following example a MySQL database called hr and table called user_details have used. It starts a transaction and then executes a command to add one row into the table user_details. The command is sent to the database and the transaction is explicitly ended with PDO::commit. Commits a transaction, returning the database connection to auto-commit mode until the next call to PDO::beginTransaction() starts a new transaction. PDO::errorCode retrieves the SQLSTATE (a two characters class value followed by a three characters subclass value) associated with the last operation on the database handle. Returns a five-char SQLSTATE as a string, or NULL if there was no operation on the statement handle. In this example, the name of the column is misspelled (genderr instead of gender), causing an error. errorCode() displays the error. Retrieves extended error information associated with the last operation on the database handle. 0 : The SQLSTATE error code. 1 : The driver-specific error code. 2 : The driver-specific error message. 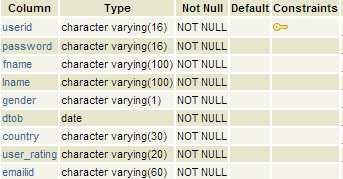 In the following example (PostgreSQL database is used), the name of the column is misspelled (genderr instead of gender), causing an error, which is then reported. Execute an SQL statement and return the number of rows affected by the statement. statement - An SQL statement to prepare and execute. An integer reporting the number of rows affected. If no rows were affected, PDO::exec() returns 0. A successful call returns the value of the requested PDO attribute. On failure, returns null. The following example (PostgreSQL database is used) retrieving database connection attributes. PDO::ATTR_CONNECTION_STATUS: Connection OK; waiting to send. Return an array of available PDO drivers in your PHP installation. An array with the list of PDO drivers. The following example returns an array of available PDO driver names. Returns the identifier of the last inserted row or sequence value into a table in the database. The following example (PostgreSQL database is used) returns the ID of the last inserted row or sequence value. statement: A string contains a valid SQL statement. driver_options: An array containing an attribute name and value (key=>value pairs ). Returns a PDOStatement object on success. On failure, returns a PDOException object, or false depending on the value of PDO::ATTR_ERRMODE. The following example prepares an SQL statement with named parameters. The following example prepares an SQL statement with question mark parameters. Executes an SQL query and returns a result set as a PDOStatement object. statement: The SQL statement to execute. In the following example PDO::query() iterate over the rowset returned by a SELECT statement. Place quotes around the input string for use in a query. string - The string to be quoted. parameter_type - Provides a data type hint for drivers that have alternate quoting styles. A quoted string that can be passed to an SQL statement, or false if failure. Following example shows how to quote a normal string. Rolls back the current transaction, as initiated by PDO::beginTransaction(). A PDOException will be thrown if no transaction is active. TRUE if the method call succeeded, FALSE otherwise. Following example begins a transaction and issues a DROP statement before rolling back the changes. In MySQL the DROP TABLE statement automatically commits the transaction, therefore nothing will roll back. PDO::ATTR_TIMEOUT: Specifies the timeout duration in seconds. Not all drivers support this option, and it's meaning may differ from driver to driver. For example, sqlite will wait for up to this time value before giving up on obtaining an writable lock, but other drivers may interpret this as a connect or a read timeout interval. PDO::ATTR_EMULATE_PREPARES Enables or disables emulation of prepared statements. Some drivers do not support native prepared statements or have limited support for them. Use this setting to force PDO to either always emulate prepared statements (if TRUE), or to try to use native prepared statements (if FALSE). PDO::ATTR_DEFAULT_FETCH_MODE: Set default fetch mode. Following example shows how to set the PDO::ATTR_ERRMODE attribute. Binds a PHP variable to a column in a result set. The following example shows how a variable can be bound to a column in a result set. Binds a parameter to the specified variable name. The following example shows how to execute a prepared statement with named placeholders. The following example shows how to execute a prepared statement with question mark placeholders. Binds a value to a named or question mark placeholder in the SQL statement. Returns the number of columns in a result set. The following example displays the number of columns of a particular table. Dump an SQL prepared command. Here is an example of PDOStatement::debugDumpParams(). Fetch the SQLSTATE of the most recent operation on the database statement object. Same to PDO::errorCode(), except that PDOStatement::errorCode() only retrieves error codes for operations performed with PDOStatement objects. In the following example, SQL query has an error (wrong column name). errorCode() displays the error. Retrieves error information associated with the last operation on the statement handle. 0 - The SQLSTATE error code. 1 - The driver-specific error code. 2 - The driver-specific error message. In the following example, SQL statement has an error, which is displayed by errorinfo(). The following example executes a prepared with bound variables. The following example shows how to fetch rows using different fetch styles. Returns an array containing the rows in a result set. PDO::FETCH_COLUMN: Returns the indicated 0-indexed column. PDO::FETCH_CLASS: Returns instances of the specified class, mapping the columns of each row to named properties in the class. An array of the remaining rows in the result set, or false if the method call fails. Returns one column in a row from the next row of a result set. The following example returns one column in a row. Retrieves the next row as an object. On success, returns an object with an instance of the class. Returns false on failure. Returns metadata for a column in a result set. The following example shows the results of retrieving the metadata. Moves the cursor to the next rowset in a multi-rowset statement handle. The following example shows how the cursor moves to the next rowset in a multi-rowset statement. Returns the number of rows affected (added, deleted, or changed) by the last statement. The following example demonstrates the uses of PDO::FETCH_ASSOC, PDO::FETCH_NUM, PDO::FETCH_BOTH, PDO::FETCH_LAZY, PDO::FETCH_OBJ constants.